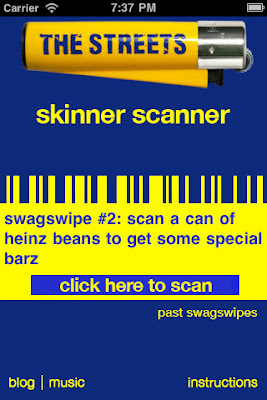 Mike Skinner AKA The Streets has got his own App, the Mike Scanner App, and I highly recommend you get it on your iPhone now. 1. Download the ‘mike scanner’ App from the App store, don’t worry it’s free. 2. Then, you will need to scan two barcodes into your new electronic streets portal. The second is the one from the side of a 300g tin of tomato soup by a well known brand. On his blog, Mike Skinner then went on to say, teasingly and warmly "good luck in your mission streets peeps. when you’re in morrisons and you’re confused and you hate me, just remember that we at beat stevie unconditionally love you." When you get the App, and pass the barcodes, you will then have access to a complete classic of a mixtape titled CYBERSPACE AND REDS featuring Kano, LoudMouth Melvin, Wiley, Rinse, Trim, Wretch and many more. The word for CYBERSPACE AND REDS is spreading fast with great excitement and high praise. Remember, This is the The Streets App. It includes a barcode scanner which you can use to scan everyday items and receive exclusive content and anything else that Mike might find in the back of the studio. Music, videos, tickets. If you like The Streets it will be good. If not this is the wrong app for you. The app is also an easy way to get the latest news from Mike Skinner's blog as well as some exclusive tracks.